The meetings were conducted as a family to boosting the morale of stakeholders and find a way of getting out of such quagmire stronger. They are of the conviction that the party would come out stronger after primaries across the states of the federation. They spoke in Abuja after a closed door meeting with Mr Adams Oshiomhole, the party’s National Chairman, of the party. They noted that the challenges that followed the party’s primaries in some states were normal in a big and vibrant party like the APC. Gov. Abudulaziz Yari of Zamfara said they were in Abuja to meet with the party’s national chairman to find a way forward following matters arising from the party’s primaries in some states. He expressed optimism that the party would come out stronger as one family from whatever challenge it may be facing, saying that it was sure of electoral victory in 2019. He added that resolutions had been made and that steps were being taken to address the situations and ensure better understanding. He, however, said that the governors were particularly concerned about INEC’s deadline for the conclusion of party primaries which is Oct. 7. “We are concerned because if we are not having candidates anywhere by Oct. 7, that automatically means we are not fielding candidates for the positions,” he said. Gov. Atiku Bagudu of Kebbi said that the meeting was convened by the party’s national chairman, adding that the governors collectively exchanged ideas and made suggestions on the way forward. “We have had the Presidential Direct Primary and it went well. There were about thousands of party members across the state, who turned out in 225 wards, and they all voted in support of President Muhammadu Buhari as the party’s candidate in the 2019 general election,” he said. He noted that while the primaries went well in some states, there were challenges in others, because according to him, it is a human process. “It is a human process, and there are bound to be issues and challenges in one or two places because it is a dynamic process, everything will be resolved. “I am quite pleased with what is happening. We are ready and tomorrow we will be on our way to participate in the last legal act of making President Muhammadu Buhari the 2019 presidential flag bearer of the APC,” he said. Also speaking, Gov. Rochas Okorocha of Imo, said party primaries normally comes with challenges, especially in a democratic structure. “The APC do have some challenges in some states and we have come to soften the rough edges so we can rebuild unity in the party and ensure that aggrieved persons are settled. “We are here to look at what to do, and of course you know our party believe in free, fair, justice and equity. “We are making sure we keep to that by giving everybody a chance to vote and be voted for,” he said. 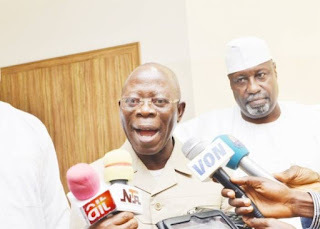 The News Agency of Nigeria (NAN) recalls that the APC national leadership had suspended the Imo governorship primaries indefinitely. Okorocha said the direct primary mode of election being adopted in the state would enable everyone exercise their franchise. “Whichever it is in Imo, we are fine, and we on ground. “We shall make sure everybody is in one place because we do not want to give the Peoples Democratic Party (PDP) edge whatsoever, because I know they are coming up with their crisis. “We will be able to resolve our own crisis as quickly as possible before the main elections,” he said. Okorocha added that despite individual differences, members of the party in the state still believe in the re-election of President Muhammadu Buhari in 2019. Gov. Ibikunle Amosun of Ogun said because it was a political season and everybody was trying to get the party’s ticket, such challenges were expected. “I think that is just what has happened, as a party you will expect that everybody wants to win, We are only disagreeing to agree,” he said. He added that the meeting was to resolve lingering problems that was confronting the party. The governors had earlier in the day, met with President Muhammadu Buhari at the Presidential Villa.